Venue says Every Saturday night, join us in Crazy Coqs following the 9.15pm ticketed event to enjoy our free, late-night music show – Round Midnight. 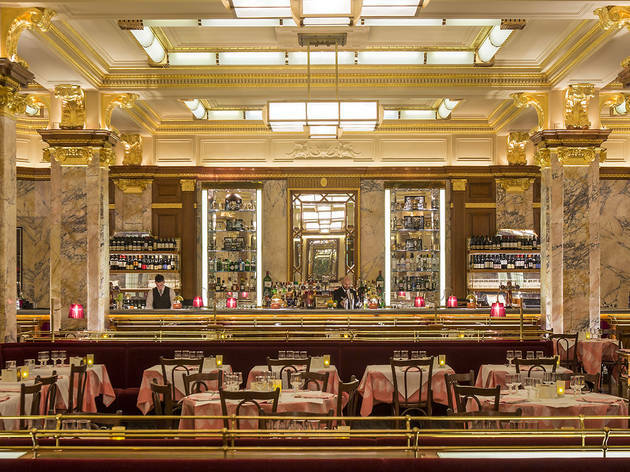 Restaurateurs Chris Corbin and Jeremy King, creators of the Wolseley and the Delaunay, have struck gold with this grand art deco basement brasserie. It’s a huge set-up and attracts a mix of tourists, office types and couples. Affordable French staples are the big draw and set menus start at under a tenner for two courses. In the months after it opened, we’d been impressed by the quality of cooking and on-the-ball service, but recently we’ve detected a dip in standards. In a meal of hits and misses, highlights included a generous main course of beef bourguignon – meaty chunks simmered in a robust red wine-onion-garlic sauce, accompanied by buttery mash. The haché steak was less impressive, though; instead of chopped meat being shaped and loosely held together, we were presented with a salty, overcooked burger patty. Chocolate profiteroles helped to restore faith – the perfectly baked crisp globes of choux pastry, crammed with splendid whipped vanilla cream, went down a treat with an indulgent chocolate sauce. The house wine, priced at bargain basement rates, provides great value. Let’s hope the kitchen brigade is back on track soon, and service staff numbers are increased at busy times. 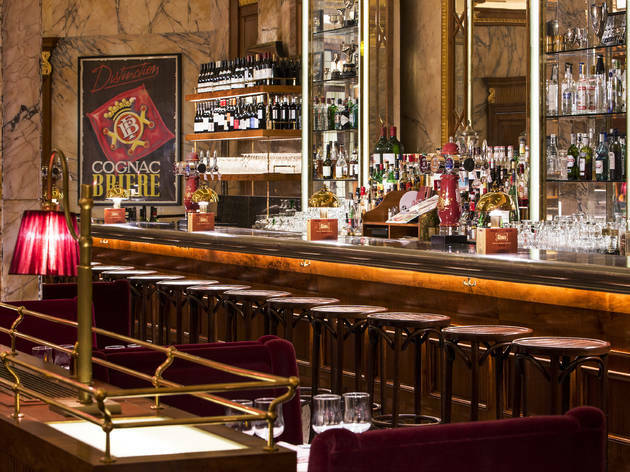 Located in the heart of Piccadilly, Brasserie Zédel is a grand and bustling Parisian brasserie with a spectacular 1930’s original interior. With a relaxed and lively atmosphere, it is perhaps best known for serving traditional French food at remarkably good value. 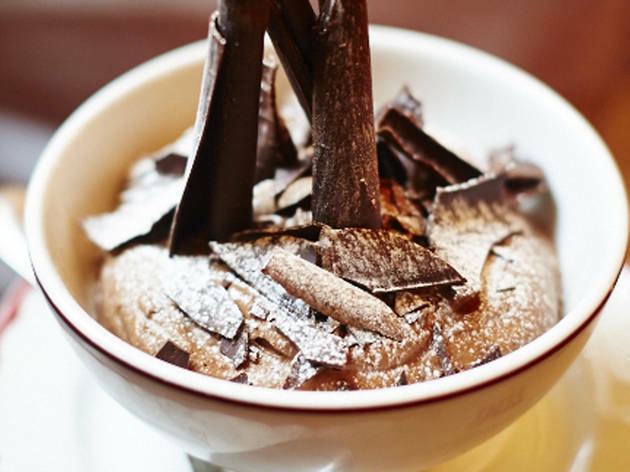 Classics such as Soupe à l’Oignon, Steak Haché and Ile Flottante can be enjoyed for both lunch and dinner, with a two-course prix fixe menu available for just £10.50. From 9.30pm each evening, live music is played in the brasserie for diners to enjoy until close. 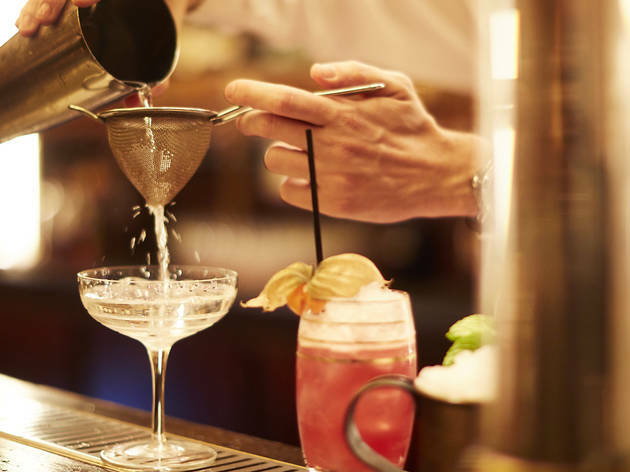 Alongside the brasserie, the building also plays host to an authentic American Bar – Bar Américain. 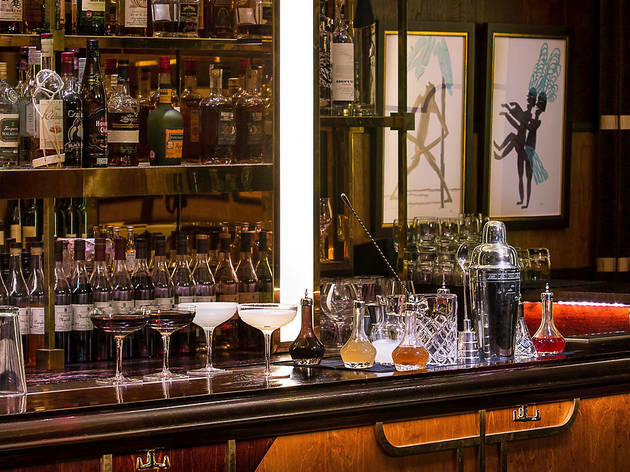 In its glamorous Art Deco setting, the dark wood-panelled space is perfect for a pre- or post-dinner drink. 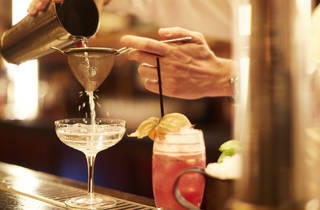 Classic cocktails such as Hemingway Daiquiris and Planters Punch are served nightly, alongside a selection of wine, champagne and beers. Just across the foyer, you will find The Crazy Coqs – an intimate live music venue. With a different show at 7pm and 9.15pm most evenings, expect cabaret, musical theatre, comedy and more. And every Saturday night, following the last ticketed event, ‘Round Midnight takes to the stage – a free of charge, late-night music show for all to enjoy. And don’t forget the ZL Café – a relaxed French café and entrance to the Brasserie, which is open from 8am on a weekday (9am at the weekend). Enjoy a croissant with your morning paper, a salad niçoise for lunch or a glass of wine on the terrace in the evening. Ate there last night with three friends inc. 2 veggies. Four people, three courses each, wine and kir = £95. Absolutely astoundingly good value, especially for Piccadilly. The food was delicious, especially the onglet. Vegetarian menu wasn't very extensive but the food was well received. And the dining hall... it's gorgeous. Who cares if it's a bit Vegas? It reminded me of Chartier in Paris for the glamour and sheer scale, but the service is London. Polite, attentive and friendly. I'm still getting over how good it was. Go! A perfect lunch venue with ambience and no pressure to rush. The Prixe Fixe menu ideal and good quality. Fantastic value for money. Lovely staff - I have already booked to go again! We were a party of 8, the service was very good without being intrusive. The food was excellent at very keen prices. We had a good evening in very pleasant surroundings. We would highly recommend this lastest addition to the London scene. worth it, just for the Wow factor. We ordered Steak Frites (without looking at the menu) and ended up with with a filet and chips... very good, and affordable at c£16. Cheapest wine on menu tasted delicous. I'll be back. Where do I begin... We came here 4 of us in total for what promised to be a wonderful lunch but we left disappointed and frankly disgusted with the service. The food itself was alright. Nothing to write home about but nothing to complain about either. The waiter went out of his way to ensure we didn't get a lemon meringue tart we ordered. He told us it was sold out then he said they'd stopped serving it... When we confronted him with the fact that other diners were receiving this elusive dessert he then said they had an allergy.... My friend went to speak to those on the table and there were no allergies. It came down to discrimination which is apauling behaviour for any establishment to have. I wouldn't recommend this place ever and I honestly hope they get what they deserve in life for such treatment. As soon as you walk down the stairs to the entrance of Brasserie Zedel, you feel like you've been transported to a little European diner where the building just happens to be ornate, the staff just happens to be smartly dressed and friendly and the food just happens to be delicious. Dinner at Brasserie Zedel was a sensory experience from start to finish, one that must be experienced by all. The interiors here are definitely the main attractive in this restaurant. Fortunately the food is not bad! But seriously, the interiors! You would never imagine walking around the ridiculously touristy area of Oxford Circus that you could find such a big, grand, beautiful basement there! (And it really is big, besides the brasserie, there is a cocktail bar and a music/comedy/theatre venue!) The brasserie is the biggest area, but it seems to be always full; still, twice I was there I managed to find seats (at the counter, for lunch, and at a table for dinner – but with time to leave as it was booked for a little later). The truly cheap Prix Fix menu is ok for the price, but not a foodie experience in any way, I still wanna go there to try some specific dishes. Looking at the tables around, they did look promising. Yet another highly praised restaurant that I can now tick off my list! I finally had the chance to dine here this weekend with my brother for Sunday lunch. It was a really great experience and that was just eating at the bar counter! We didn't have a reservation so those were the only seats they had at the time we arrived but we didn't mind, as we were quite hungry and happy to sit down to eat. After a quick browse, I went for the Steak Tartare. Probably not a surprise since that's a typical French dish that I tend to order when I'm at a French restaurant. Although it was well presented - it came on a plate on its own with a beautiful egg yolk on top and a side serving of salad - I thought that the meat was too finely minced. The texture was far too smooth even though the taste was good! I prefer it to have small chunks so that there's still something to chew on. For dessert, we ordered two different kinds so that we could share and have a taste of more than one. I went for the Profiteroles, which were rather delicious! These were choux pastry puffs stuffed with crème patissière and drizzled with a warm, dark chocolate sauce when served. They tasted pretty authentic even though I know there is also a version with vanilla ice cream inside. Our second dessert was the Lemon Meringue Tart. This had a great tart pastry - golden, crunchy, and thick at the edge while thin on the bottom. The lemon curd was really good because we could taste the tartness of the lemon and it wasn't too sweet either. I wasn't a fan of the meringue because I prefer a hard meringue while this version was soft and toasted on top with a blowtorch. The service and atmosphere are definitely highlights too. Everyone from the hosts, to the waiters, to the bartenders and the cloakroom attendant were absolutely lovely! It's quick service too, as our food arrived in no time after we ordered. The high ceiling, the marble and the gold make the interior decor absolutely stunning. A really nice place to come for a celebration, for a date, with friends and with family! Wondering what to do with a free weekend that's a little bit different? Go to Zedel. It's pleasantly busy and the food will melt in your mouth but best of all is the decor. you'll feel like you just fell in to Great Gatsby with its stunning high ceilings, grand staircases and plush seating. I would say that in the peak time, not surprisingly, the staff were a little distracted. Most notably clearing the table while I was still eating which is a big no in my books. Though aside from that they were quick to re-lay the table and kept us topped up with wine and water. Stumbled across this place by accident after falling out of the theatre. Me and some friends just wanted a drink, so we went downstairs two floors and we found the bar- wow! Is all I can say! How did I not know about this before! We sat in the American bar and the staff all had white dinner jackets on and were very attentive. Drinks were fairly priced andcame with some nuts and snacks which were tasty! 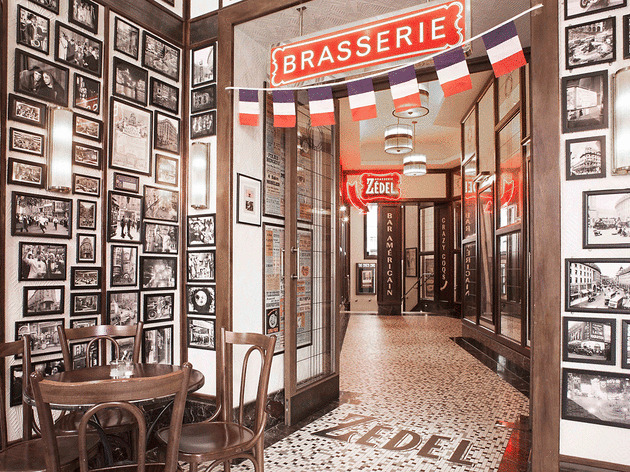 If you walk past Brasserie Zedel it's an unassuming yet charming-looking little venue. Walk in and down however and you'll be met with an incredible salon area that's plenty abuzz with chatter and excitement and might make you feel transported to a different place and time. The menu and wine list both have a lot of options to suit different tastes and budgets. I had the steak tartare with a side of french fries and my friend had the duck confit with a side of mashed potatoes and we shared a 250 ml wine carafe. We felt it was a very complete meal given the price (approx. £40) and both things were very good. The service was somewhat disappointing, but in fairness there was not an empty chair in the whole place. Midway through dinner they also dimmed the lights and there was a jazz singer, which set a nice tone and mood for the evening. We actually stumbled upon this place after an evening at the theatre. We were searching for a relaxed place to catch up over a few drinks and the entrance offered no clue as to how glamorous the art deco interior was. The posters and other fittings oozed pure French decadence of the 1930s. Through the winding staircase we landed at a vestibule and decided that the American Bar would suit our needs. The waiters were smart and in such a bygone setting you could easily imagine yourself sharing bourbons with Rick from Casablanca. Have you been to Basserie Zedel? You bloody well should! It’s a hulk of a place nestled in the back streets of Piccadilly. A labyrinth of eating and drinking you can perch in the café, where you can have sweet and savoury pastries, light snacks, coffee or an alcoholic beverage, there is also the brasseries and the live room, which is where I frequented when I visited. This is art deco haven and so achingly retro, I adored it. I love that a place so grand and large exists. There is a real emphasis on staying for a while here, there are plenty of places, serving different foods for your different needs you could essentially stay from day to eve and have a totally different experience in each section. I was in the room dedicated to live shows and I went to see a musical version of…wait for it…..it was so perfect….The Time Machine! It was great, it was like stepping back in time! The waiters and waitresses are decked out in smart waistcoats and serve you food and drink throughout the show. Fab. I had a G & T and two mini salt beef bagels. They were yummy and only a fiver. The show was also a fiver to get in and was great. This feels like a secret but a huge and very obvious secret in a very central location. Go! It’s really good and suits all budgets. This is a great place for a nice drink or a nice French meal without it costing too much. I went along on Bastille Night so the atmosphere was buzzing and so many people dressed French. The food was quite nice. I would certainly visit again. Walking past on the main streets of Piccadilly Circus, you would think Brassiere Zedel is a small and cute French restaurant.Having overlooked this venue many times, assuming it was too expensive and would be fully booked, I was amazed to find a huge underground Labyrinth of bars, cabaret venue and a massive restaurant space.They offer a fantastic Prix Fixe menu for a budget friendly £9.95 for two courses as well.I managed to stick to tap water and only spent around £11.50 including a tip! The venue itself is just stunning.You would understandably forget you were in London and mistake this restaurant for Paris with amazing art work and fantastic attention to detail across the venue. If you want to seriously impress friends who think they have seen anything in London (as I once did) this is the place to go! Elegant, affordable and with a fantastic vegetarian menu, this place really does tick a number of boxes. I have eaten here a number of times, this time I came with two friends prior to attending a show, we had no trouble reserving a table on the day. On entry to the building you walk through a small Parisian cafe and down a large extravagant staircase; walls covered in art and mirrors reaching the lobby at the bottom. From the lobby there are a number of rooms off it including the brasserie, a cocktail bar and an entertainment/performance room I believe for events. The brasserie is in the basement although you wouldn't realise once down there with the high ceilings and large light 'windows'. Most tables are in a booth format, reminiscent of a true French brasserie. The menu is well priced, the food is rich and comforting but the venue here is what is really special, for a venue like this you'd expect to pay double the price for a meal, perhaps the sheer size of the brasserie allows them to charge less with such a high volume of customers! Live music begins at 9pm but sadly we were too early for this, I will definitely be back to sample the music (and their dessert menu too!). 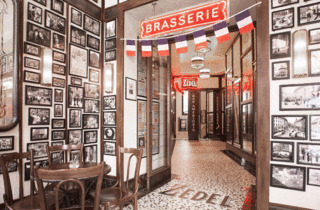 When we first arrived at Brasserie Zedel, from street level it looked like a cliche French style cafe perched on the edge of Piccadilly Circus. But then when we descended two floors, there was the speakeasy style American Bar and the opulent and enormous dining room. The walls are clad in marble and gold leaf and it's hard to believe you're actually in a west end basement. I'm vegetarian and a friend of mine is gluten free and conveniently they had a separate menu for each requirement. The main menu has a lot of French words on it but you can also request a fully English menu if you dare! The cocktails are about £9.50 and a bottle of the house wine was only £22. The menu is quite reasonable and the best deal on the menu is a steak hache with chips and a starter or dessert for £9.75. I had the spinach and cream cheese puff pastry which was lovely, along with a generous portion of heirloom tomatoes and shallots on the side. The food was all very good and the only major fault I found and couldn't ignore was the complete lack of service. We had to ask for everything - enough menus for all the people at the table, to take our order, to get our bill, etc. Also the bottle of wine we ordered sat on the prep table right next to us for a good five minutes with a few servers taking a look at it before we finally got served it. In the end, they included a 15% tip on the bill, which must have been trying to counteract the reasonable menu prices. Even on a Wednesday night at 7:00, the restaurant was fully booked, so it's well worth reserving. The dining room is stunning and it's a nice place to go for a fancy meal that won't break the bank. I'm not sure if the service was so poor because we were a table of six, but I hope that if I go back it would be better. Brasserie Zedel is perfect for a catch up with a large group. The food and service is fab however as it is such a large restaurant and very popular the food is quite slow coming out and also there was a wait between courses. I think I prefer to head to the bar for drinks which is really cool and a hidden find in the heart of Piccadilly. Perfect for pre theatre drinks too. Here is a restaurant and bar complex with the Wow! factor. Its address is Piccadilly Circus but its entrance is actually in Glasshouse street. Entering an unassuming looking café with some tables and chairs outside, you descend a circular staircase to a subterranean vestibule that looks like the set of a 1950s French film. One of the doors leads to Brasserie Zedel, a huge opulent ornate dining room, replicating a high end Parisian restaurant from some more glamourous era. It is busy and noisy and you feel like you have stepped into some hidden world. The menu is French, the food is good and the prices are reasonable for central London. It has a nice wine and cocktail list and the service was fine on the evening I was there. Overall, the fare was acceptable, but the real reason to go here, is for the amazement of seeing such a venue hidden right in the heart of Central London. Zedels is almost an immersive experience, descend the Art Deco staircase and you are suddenly in a Wes Anderson film. Classic bistro style branded plates, smart tall waiters floating passed with mustouches and the clatter of plates and cutlery echoing in the vast space. Perfect for a special occasion - lobster and oyster towers on ice, or an inexpensive pre theatre meal - steak hacks frites! The food is not out of this world and the service isn't quite as immaculate as La Cupole in Paris but it is good and reliable and I love this characterful place just off Piccadilly. We went as a large family group for my mum's 72 birthday. The decor and vibe at Zedel are tremendous. It should be a great choice for such a get together and indeed the food on the whole was lovely. Sadly the service was just so lack lustre that I'm not sure i would go back or recommend it. Our table wasn't ready on arrival, once seated it took ages to get any service, drinks took ages to come, food arrived in dribs and drabs, sides for mains arrived ages after the dishes themselves, staff were absent, distracted and offhand. We had to practically beg for dessert - and given we spent close to £300 I think it just wasn't good enough. Have you ever wondered what lies beneath the bright lights of Piccadilly Circus? Well, neither had I but once you've descended the stairwell to the gilded ballroom and found Brasserie Zédel it won't be forgotten. We were seated quickly on plush chairs in the centre of this fantastically huge space with a constant stream of suited staff whizzing past, glasses chinking and chatter rising above the traditional music played by the live band on the outskirts of the room. The menu is unapologetically French and traditional, much like the atmosphere, but far more affordable than you'd expect in the heart of London. Starters are cut deli-style from a selection and so despite being generously portioned are not always piping hot. Nonetheless the rich Boeuf Bourginon and accompanying mash that followed left me feeling snug and contented - though not enough to resist the temptation of the profiteroles that were wafted under my nose. It's best when it's busiest and you'll be granted the rarity of enjoying your table for almost as long as you like given that it is open 'till 12 midnight. This is not one to miss, go soon, go often and for pete's sake go on an empty stomach. The classic French food is decent, and the prices – especially the set menus – are uncommonly reasonable for the West End. But the real reason to go is the setting. The very fact that such a huge, opulently decorated room exists so close to the gaudy noise of Piccadilly Circus is extraordinary. The fact that you can eat in it without having to sell an internal organ simply beggars belief. Take your parents – they'll lap up the classy ambience so much that they'll probably even offer to pick up the bill. Where in the middle of Central London can you dine on fine french cuisine in grand surroundings without clearing your life savings? Brasserie Zedel? Correct! 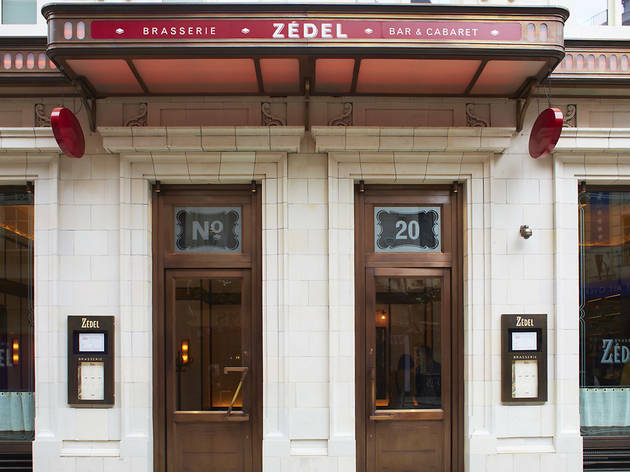 An excellent french restaurant located only seconds away from Piccadilly Circus tube station, Brasserie Zedel is actually an underground restaurant with all the flair and grandeur as you’d expect from all things French. The dining experience starts even before you enter the restaurant. As you make your way down, notice the mosaic floors, art decor and vintage posters all over the walls reminiscent of the glamorous 1930’s. It’s like be transported back in time to the roaring good times of the 30’s. Leave your belonging in the cloakroom and you’ll enter a marvellously spacious dining area with its marbled walls, golden railings and elegant bar. The food isn’t bad either. Whilst I am no foodie, I can confirm at least that the 3-course set menu is plentiful and certainly satisfying. Scanning the menu, there are a lot of choices and a daily dish of the day. 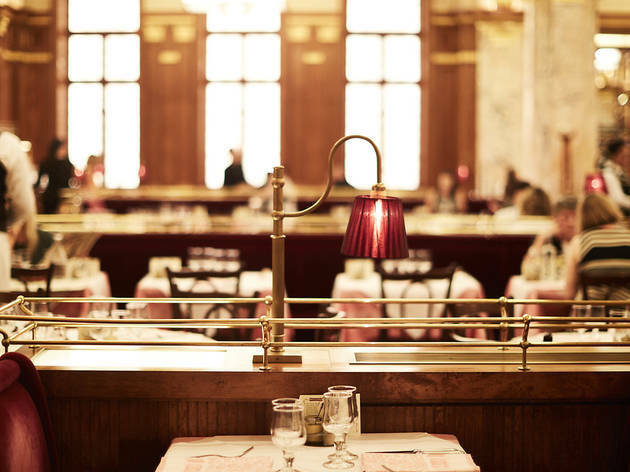 Every bit of Brasserie Zedel screams fancy with a price tag that might actually make you want to scream. But you’ll be amazed at the price. For such a fancy dining experience, it’s dead cheap. The menu is in french but fear not, simply ask for the English translated menu if you don’t know your jambon from your poisson. If you’re still looking to carry the night on, the highly regarded Bar American right next door is sure to give you the perfect nightcap. 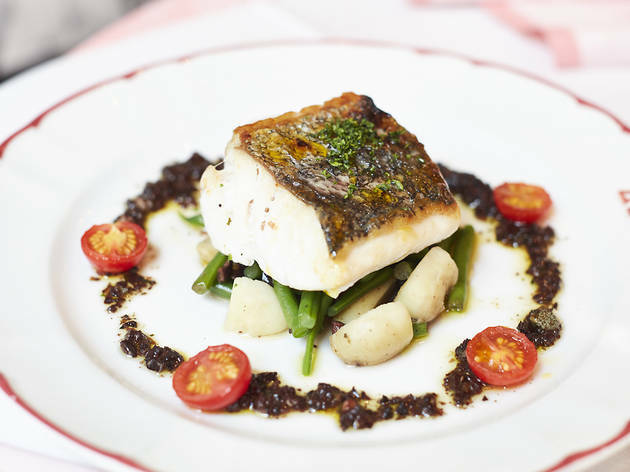 Perfect for those looking to impress without blowing your wallet, Brasserie Zedel comes highly recommended from yours truly. This brasserie is like walking into Midnight in Paris, or A Moveable Feast, or a Gatsby party after midnight, when the first guests - the loudest - are passed out in the corner, snoring loudly already, but the party is still lingering in its atmospheric charm, and the best people are still on their feet. 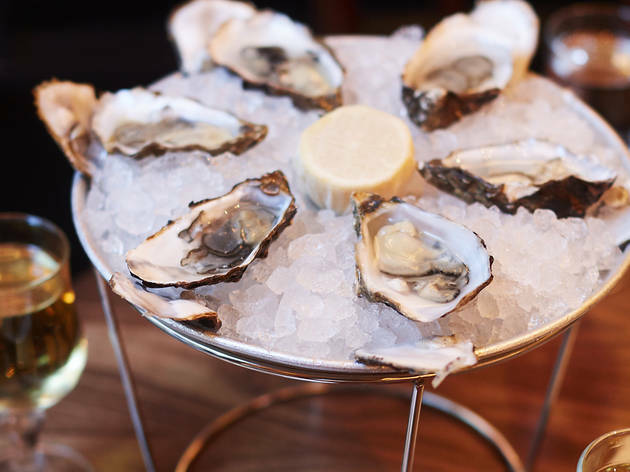 I still can't quite get over how cheap this restaurant is, considering it is just off the hustle and bustle of Piccadilly Circus, and serves the likes of oysters and classic French bistro favourites. All this up to midnight. Brasserie Zédel is, from now on, forever my first choice for post-theatre dining, but honestly, I wouldn't mind popping in here every night when I'm out and about town. Descending to the low level, you feel like you've been whisked back a few decades, and as if behind each door a different type of happiness awaits. Including the toilets. Perhaps the hall can be compared to the holiday doors of the Nightmare Before Christmas. Although up to today I've only had the chance to try the restaurant, I cannot wait to make a trip to the bar too, and perhaps spend a whole evening in the basement of this magical bistro. And then I haven't even began to describe how fantastic the food was - for a very reasonable price, the three of us enjoyed oysters, starters, mains and a shared dessert, as well as a bottle of wine. This should have you running home crying from Soho, if you've drunk just a little too much and forgot that you didn't actually plan on spending your entire month's wages on a single dinner. Not so in Brasserie Zédel. So, if you've dressed to impress, then look no further. The underground gilded dining room is just beautiful, it feels like a blend of Parisian chic and Downton Abbey at Christmas. if you arrive early there is a lovely bar to sit at chatting broken french whilst sipping wine. The food is good, I don't think it quite matches the ambience but the fixed price menu in particular is a great price for what you get, bring on the cafe gourmand. If you fancy a quick bite or a coffee the upstairs cafe does the job, but if you are after a post work cocktail the bar American doesn't disappoint, the lazy river and lindy hop cocktails are particularly delicious. Hidden beneath Piccadilly Circus, this cavernous but gorgeous room lets you feel fancy without breaking the bank. The price fixe menu is perfectly reasonable and are actually items you would want to order (not like other places that put the duff meals on the cheap menu). I’ve taken various groups of people and they’ve all been thoroughly impressed. Don’t scared to chance a walk-in here, the huge room means you won’t have to wait long. Decor: as you walk down the staircase you're literally travelling back in time. The beautiful interior makes you temporary forget you're actually in grime of tourist central. Food: probably one of the best value for quality in central London. My favourite is the beef bourguignon - perfect every time. I've never had a bad time there, and every friend I bring there always says they can't believe they there is a place like this in central and they can't wait to bring someone else here! Tacky decor, much too large for any ambience, surly service, and bland food. I can't believe I've just found this place. I'm never having an unremarkable meal (at any number of average high street chains scattered around central London) again when I can go here. What looks like an average cafe (the doorman outside is a bit of a give away of the class that lies inside) leads downstairs to a fabulous foyer leading to a bar, cabaret and the brasserie. The brasserie is stunning and feels a million miles away from the bustling heart of the city. This place is not all style and no stubstance. The menu is a mix of eye twitching expense (scallops) and good value. There is also a dish of the day plus two set menus for the lighter purse. I went for the three course menu with wine, bottled water and tea/coffee. The celeriac salad starter was, as the French say, bof. The meal improved with the trout and hit an ulmighty high with the floating island (meringue and custard). Even if the French aren't your fancy it's worth a visit just for the the excitement of being somewhere so different without needing a mortgage to fund the experience. 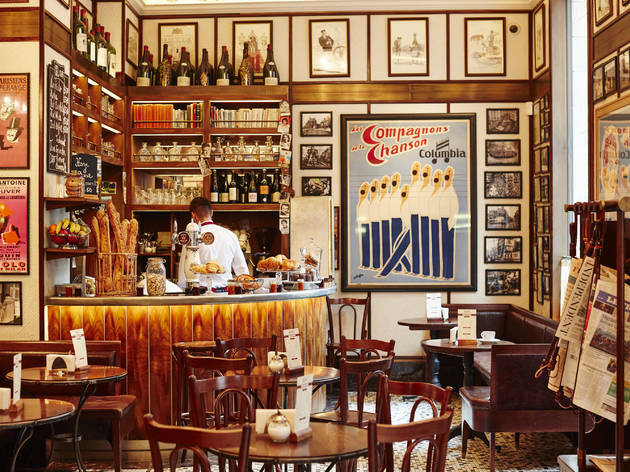 Fabulous French decor for starters: perfect imitation of a Parisian cafe when you enter. Headed downstairs, there is a such grand art deco, it's fabulous. The dining room is all gilt and large clocks and waiters in proper black-and-white dress. I got the carrots with Dijon sauce and the broccoli quiche. The first was light and tasty, with just enough Dijon mustard. The quiche was DELICIOUS. Soft and so buttery. For less than 10 quid for my meal, I was pleasantly happy. The service was also very good: far better than your typical London establishment. The crowd seemed to be a mix of tourists and Londoners. I arranged to meet a friend at Brasserie Zedel without doing much research into the restaurant, apart from knowing it was inexpensive and central. I was expecting a small French bistro- instead we entered a huge restaurant, in the style of an old-school French brasserie with mirrors and gold adorning the walls. We opted for the cheapest option on the menu- three courses for £13, and ate a starter of carottes rapées (grated carrot in a vinaigrette), coq au vin, and blueberry cheesecake tart, with unlimited bread on the side. It was all very tasty, and excellent for the price. Service was French style- silent and efficient- in fact too efficient as we felt a little rushed. This place is not for everyone, as it gets very noisy and certainly isn't for an intimate dinner. However for the French classics at a low price this fits the bill nicely. Oh how I do not like this place. It feels weird. It reminded me of going to a fake restaurant in Vegas. It felt artificial and way too big. Just wrong. The food was OK. But I couldn't shake the feeling of everything feeling fake to me. I love Brasserie Zedel! Not because the food is outstanding (it isn't) but because the setting, atmosphere and service are brilliant. Even waiting for a table to become free in the American Bar or upstairs (if there's room) is a pleasure. The food is basic French fare and can be a little hit or miss. The wine list is extensive and so there is something for everyone. The setting can't be beaten. Seriously good value food in a stunningly beautiful room. They do turn tables quite quickly when it's really busy but given the prices and the sheer scale of the room that's understandable. And when it's less busy there's no rush at all. The steak hache is brilliant. Great value for money and is a nice escape from the hustle and bustle of Piccadilly Circus. They have a great bar downstairs next to the main restaurant which has great cocktails and actually could be a good place for a date if you have decided for some reason to go super central! The restaurant hall is impressive (yes hall, it is huge) but not ideal if you are looking for something cosy and personal. 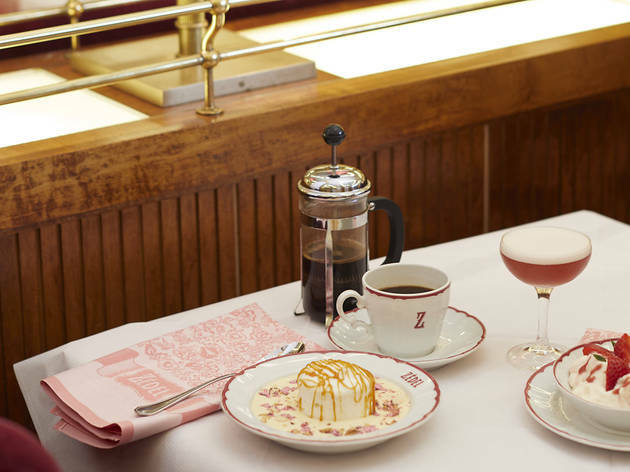 If you're in the mood to inhabit a candy-coloured, Wes Anderson universe for a budget-friendly price, Brasserie Zedel is the place to go. It combines that Grand European cafe style with a great central London location. 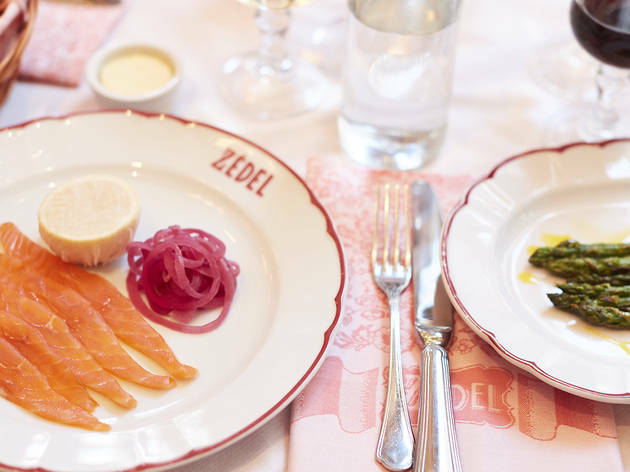 Whilst Brasserie Zedel isn't quite the steal it used to be (the prix fixe menu price has steadily crept up whilst the good reviews have been rolling in), it's still astoundingly good value for the location and surroundings. It's the kind of place that you would take your parents to (especially if they like Cafe Rouge, of which this is a grander and less crap version of). Be warned, the service can swing wildly between disinterested or overly attentive and fussy. The good thing about this is it's a *ridiculously* OTT old-school fancy dining room. You could definitely take your parents here when they're visiting you in London, and trick them into thinking you'd really made the big time. They'd be well into it. Oh yeah, that's because the other good thing about is that it's pretty cheap! The less good thing about it: the food is about as retro as the decor, and not in a good way. It definitely feels like the last 20 years of cooking hasn't happened. It's all perfectly edible of course so can't really complain but it's not going to knock your socks off. On the other hand, this might also appeal to your mum and dad, if they still consider things like pesto and hummus to be suspiciously foreign. It's rare to be able to find such affordable luxury in central London, and I'm amazed this place only has three stars average. The food is excellent and good quality, the ambience is lovely, and it's also surprisingly good value. Tip: Try the breakfast, it's modern without being too hipster. 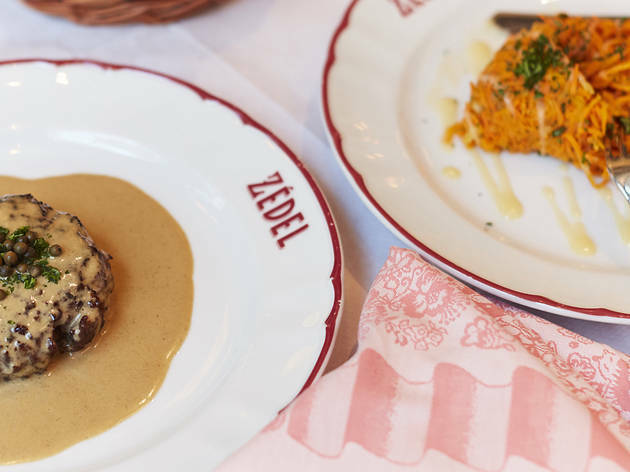 Beautiful, grand setting with staple and affordable French cuisine in the heart of Piccadilly, Zedel is definitely worth having on your London map. Great value for money and extremely efficient service. Great atmosphere, given the size of the restaurant and as another user pointed out, reminds you of Chartier in Paris. Very smart. Such a beautiful setting nothing else really matters. It's a little like stepping into a time machine everything including the service is old school in a very charming way. The food is very standard but not bad, like going home for dinner, and its so reasonably priced its a great venue for large tables. You feel fancy and can come away having spent well under £50 per person including booze! Below average food, below average service. I was not impressed. If you want real French (complete with terrible service but delicious food) go to Boullion Chartier in Paris. 100 times better than this place! I have no idea how so many people don't know about this place, because the surface area of the toilets alone spans pretty much the entirety of Zone 1. Anyway, a restaurant is always off to a good start when presenting me with a bread basket and yummy French salted butter, and at lunch time on a Saturday. The bread itself was a little hard but the gesture was still appreciated. Other than my hungover veggie friend who impulsively opted for the cheese plate, we all went for for the set menu consisting of a course of grated carrots followed by steak (albeit haché) and chips, which was a real bargain for £8.95. I don't think I can describe how incredible those carrots were as well. The vibe of the restaurant itself feels a little touristy - but hey it's Piccadilly, so what do you expect! Brasserie Zedel is great in many ways and really I'd give it 3.5 stars but you can only give full stars on here. Its really quite amazing to leave the hubub of Piccadilly and enter this small cafe, before finding this winding staircase at the back that heads down into a vestibule with a bar and a small club in it, and most importantly the brasserie. When u walk in it opens up in front of you to reveal a huge cavernous and marble clad art deco European style dining hall, and if your there at the right time the band may be playing. The food may not be the best cooking in the world, but it does what it promises - its good value and tasty and with the perfect menu and style for the type of European dining hall its emulating. Personally I enjoy the Steak Hache with fries and with a G&T or wine you will pay under £15. Usually you can get a table just by turning up but at peak hours in the evening I'd say book otherwise you could be waiting in the American Bar a long time and it's not particularly cheap. If you're after a good quick bite to eat that's not too expensive or a pre-theatre dinner its a great place to choose. Brasserie Zedel. You're cool, just sitting there underneath Piccadilly Circus where no one would find you unless they knew where to look. This huge underground French restaurant actually has a distinctly German vibe to it. The cuisine is a mix of all the French and German greats - expect sausage, expect escargots, expect good reliable service. The food and wine are both reasonable, especially for this part of town. Very convenient for theatre goers, but very un-touristy. The food is a little lacklustre in my opinion, but it's good value for money, the service is good (and fast) and it's definitely hearty. You can't really go far wrong with a Corbin and King venue but usually they're pretty pricey. Instead, this place is astoundingly good value - especially when you consider the glorious setting. Sure they turn tables really quickly - even when there are plenty of tables free (it's huge, so it's rarely completely full) - but you can hardly argue too much with that given the prices. Go for the steak hache - it's delicious. I'm giving it 4 stars for the art deco design of this beautiful underground venue! The dining area is huge, the food is fairly standard but service is efficient. Took some friends from Oz and they still rave about it.